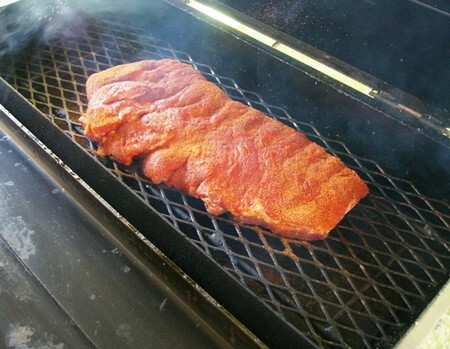 A smoker barbecue cooks meat slowly at low temperatures for long periods of time. The meat is cooked over hardwood coals to produce an aromatic smoke and deep flavor. Thick cuts of beef should be used in a smoker barbecue. Whatever the choice of meat is, it has to be thick cut. Unlike the standard back yard grill, a smoker is made of cast iron, heavy gauge steel and is built to withstand extremely high temperatures for extend time frames. Smokers often times are shaped like drums or barrels. They have a smoke chamber that looks like a chimney to vent the smoke. A great chef knows when to check the fire in the smoker and when to baste the meat to prevent it from drying. Place ten pounds of hardwood chunks into your smoker. You can purchase hardwood at your local grocery store or any hardwood store that sells smokers and backyard grills. Hardwood chucks look like firewood, but with flavor. They come in a variety of flavors. The most classic of them all is hickory. Light the wood chucks. Season your meat. You should use your own blend of seasonings called a dry rub. These rubs are often kept top secrets by chefs. They also seal in juices and add flavor to your meat. For your thick cut beef try blending chilli powder, cayenne pepper, cracked peppercorns, dried mustard and more. These all compliment the meat well. When the time comes, baste the meat with olive oil and the spice mix. Check the coals. If they have turned white, rake them to the side and add your grate to the smoker. Lightly oil the grate to prevent the meat from sticking. Then place a pot of water inside the grill to ensure moisture. Place your beef fat side down onto the grate. It should be facing away from the coals and the meat should not be directly over the fire. Close the smoker’s lid. Adjust the vents and the chimney to control the temperature and smoke release. Of the vents are fully open it increases the temperature. You can monitor the temperature of the grill with an oven thermometer. The temperature needs to be sustained at 200 degrees Fahrenheit. To keep the fires consistent add 3-5 chucks of hardwood every hour. Baste your meat every 90 minutes with your mopping sauce. Cooking time should be 30 minutes per pound. Remove the meat when the internal meat thermometer reaches 165 degrees.